HomeEventi Show e saloniFinito l’eTour Europe and the winner is… l’eMobility! Salisburgo, Austria. 10 Maggio 2016. Tutte le squadre partecipanti hanno raggiunto il traguardo dopo una percorrenza di 3,900 km e 9 giorni fino a Salisburgo. Nella categoria CO il vincitore è Peter Walser dal team Swiss con Tesla Model S.
Nella Categoria C2 (fino a 300 km NEDC) è la squadra LEMnet con Heiner Sietas e Dirk Asmus con la loro Nissan Leaf. The eTour Europe finished and the winner is… the eMobility! Salzburg, Austria. 10th Maggio 2016. All participating teams finished the 3.900 km eRally in 9 days in Salzburg. 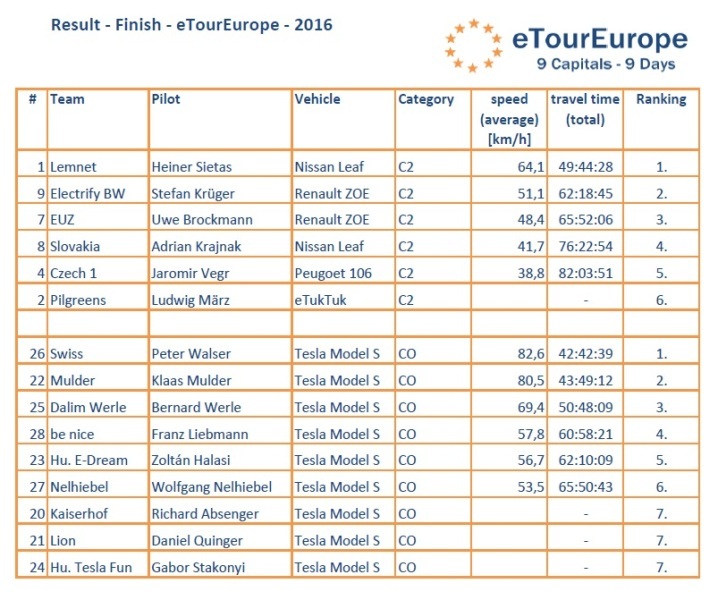 In the CO Category is Peter Walser from team Swiss the winner with Tesla Model S.
In the C2 Category (up to 300 km NEDC) the team LEMnet with Heiner Sietas and Dirk Asmus with their Nissan Leaf.